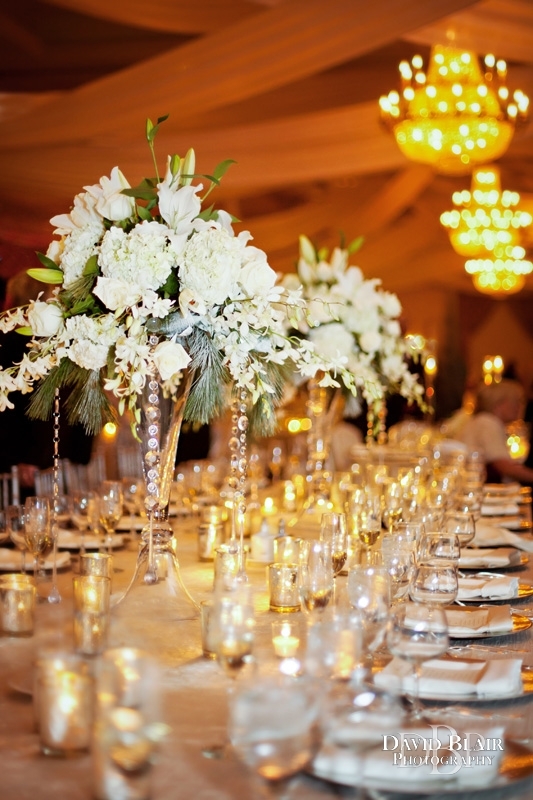 This is a collection of elegant wedding reception centerpieces. I love getting to document details like these. Part of the fun of being a wedding photographer is walking into a reception hall and seeing how the bride has chosen to decorate her day. Every wedding is unique and I hope as you look through these you are inspired in your planning. You truly have so many options when it comes to your tables. I love how this first image I took at the Hurstbourne country club includes stacked vases that give a unique and modern look to this table with flowers not only overflowing at the top, but also in the center. 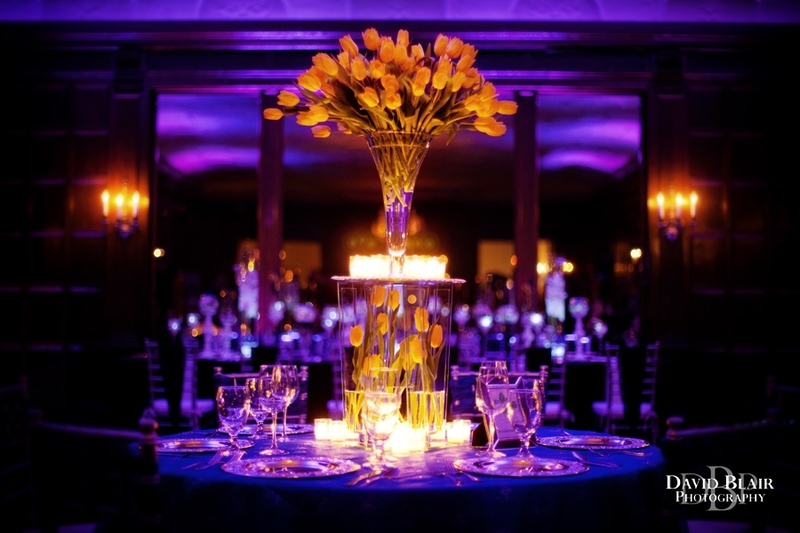 The candles on the table also go well with the antique lighting around the room and the colorful up-lighting finishes off the whole setting. This table has an overall elegant look, but with a modern twist with the floating candles among the ornate candle holders. This long banquet table was truly over-the-top with the sea of tea light candles and large beautiful flower arrangements. It seemed quite fitting among the chandeliers of the Seelbach Crystal Ballroom. This exquisite scene is from the Brown Hotel in downtown Louisville. These high centerpieces look great in this room and also allow guests to easily see across the table rather than having to lean around the centerpiece. These handmade centerpieces were done by the bride and her bridesmaids. Personal notes and memories from the couples love story hang from the branches of each while floating candles burn atop flower filled vases. 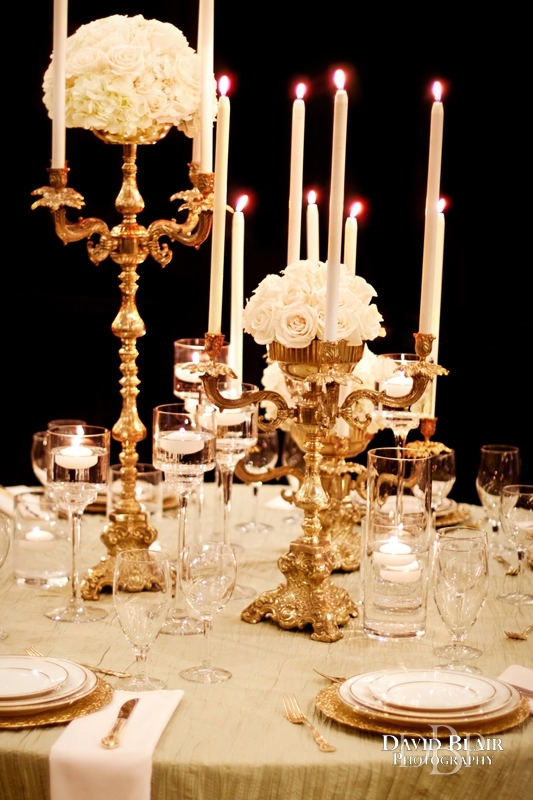 In addition to flowers and candles simply having lots of glasses on your tables adds a more luxurious look. See More of David’s Detail Photos Here.